According to Scott Cunningham in his book Wicca: A Guide for the Solitary Practitioner, the magic circle can be thought of as “a well-defined though non-physical temple.” The practice of casting protective circles is very ancient and has been used by countless spiritual traditions on many continents. My Wiccan teachers have given me an immense appreciation for the power of working in such a sacred space. Personally, I wouldn’t do magic without it. It enables me to invite good energies in while keeping bad energies out! Incense and Astral Candle—I begin by lighting incense that corresponds with the kind of magical work I’m going to do such as healing, protection, etc. If I’m doing nothing specific I use an all-purpose blend designed to bring protective, cleansing and healing energy to the circle I’m about to cast. I also light my Astral candle which corresponds to my Zodiac sign. Grounding—I take three deep breaths and try to send any negative energy I’m holding onto into the ground. My personal experience of this step is that it makes my feet feel heavy and rooted. It is a wonderful feeling. First Energy Raising—I visualize bringing up earth energy from the core of our planet and into my feet. It makes my feet tingle and I see it in my mind’s eye as the color red. I then visualize pulling down the energy of the sun, moon and stars through my head which I see as the color white. These two energy strands then meet in the middle of my body and wrap around each other like a DNA double helix. Then I send the energy through my arms and hands. When my hands begin to feel warm, I know I’m ready to cast the circle. I never cast a circle until I reach this point. Call the Quarters—I usually do this extemporaneously and my practice is fairly Wiccan in nature. I start in the East and call the Guardians and Ancient Ones/Ancestors of the East to join me as well as the Elemental Spirit of Air. I often say something about the qualities of the Element I’m invoking such as inspiration and creativity for Air. Then I move clockwise to the South and Fire, to the West and Water, and finally to the North and Earth. (Others designate things differently but this is what works for me.) 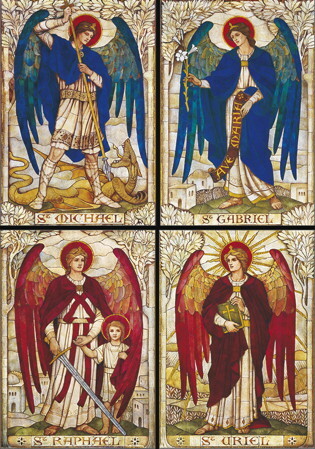 A number of Christians associate the Guardians with archangels: Raphael is East, Michael is South, Gabriel is West and Uriel is North. Call the Divine Presence—I make the sign of the cross as I gather in the name of God, the Great Mystery, Jesus Christ, the Light of the World, and Sophia, Holy Wisdom, which is how I envision the Holy Trinity. I ask them to help me in my time of meditation and magic. I also call on St. Brigid to lend her aid as well. (I have an icon of her on my altar and have a special affinity with her.) As I invoke the name of this Triple goddess who was morphed into a Christian saint, I make a circle on my breast plate three times for the Maiden, Mother, and Crone aspect of Brigid. Second Energy Raising—I then take a seat and start my meditation/energy raising. I use an original chant: “Energize the sacred sphere, so perfect love casts out all fear.” I also use a Druidic tone chant I know as the Oh-Ee-Ah. The “Oh” (as in dough) forms the energy in my body, the “Ee” (as in teeth) pulls it back like an arrow in a bow, then the “Ah” (as in father) lets it fly out into the circle. I also spend some time in silent meditation and continue to raise energy until I know it’s time for my magical work to begin. Third Energy Raising—In addition to ritual actions I also try to send positive energy to whoever or whatever needs it. This goes out to individuals, nature and world situations that have been on my mind. I also sometimes spend extra time in silent meditation. Opening the Circle—When I’m finished I dismiss the Quarters, starting in the North and going counter-clockwise until I end up in facing East. I thank the Guardians, Ancient Ones and Elemental Spirits of each direction for their presence and help. I then thank the Trinity as well as Brigid for their Holy Presence in my circle. Then, in a sweeping motion with my hand I turn counterclockwise and imagine the circle being lifted. As I do this, I say, “This Circle is open but it is never unbroken because it is a Circle woven in love.” The last thing I do is send any leftover energy that was raised back into the earth and to nurture the plants and animals closest to me. This entry was posted in Incense, Magic, Meditation, Prayer and tagged Casting the Circle, Christian, Circle casting, Magic, Spirituality, Wicca. Bookmark the permalink.